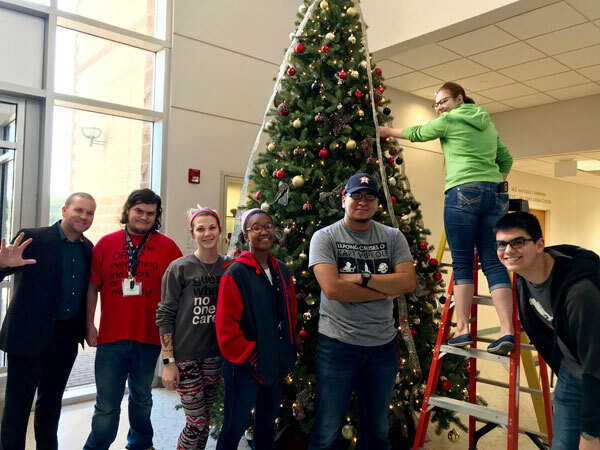 Michael Wilkinson, left, director of UHV Student Life & Services, helps decorate the UHV Giving Tree on Monday with freshman seminar students Dennis Barbee, Caralyn Podsim, Darinae Dixon, Luis Cigarro, Elizabeth Matula and Matthew Salinas. The Giving Tree is set up in the UHV University Center foyer, and donations will benefit Adopt-A-Pet and Mid-Coast Family Services. The holiday season is here, and the University of Houston-Victoria Student Government Association is celebrating by hosting its 15th annual Giving Tree donation drive to benefit Victoria nonprofit organizations. The Giving Tree gives UHV students, faculty and staff, and community members the opportunity to donate items to different nonprofit organizations. This year, the Giving Tree will benefit Adopt-A-Pet and Mid-Coast Family Services. Those who want to donate can leave requested items under one of two Giving Trees on campus through Dec. 15. The first tree is in the foyer of UHV University Center, 3007 N. Ben Wilson St. Students also have their own tree in Jaguar Hall Commons, 2705 Houston Highway. Each year, student government executive board members choose area charities to benefit from the Giving Tree, solicit donations and make arrangements to deliver the supplies once the campaign concludes. In addition, both Mid-Coast and Adopt-A-Pet are longtime partners with UHV that participate in student volunteering opportunities, such as Jags Join In – Day of Service. They also have taken part in campus activities, such as Pet Away Stress, that benefit students, Yaws said. Items requested by Mid-Coast Family Services include paper towels, fabric softener, blankets, jackets, clothes, children’s books, toys, nonperishable food, hygiene supplies, deodorant, toothbrushes, toothpaste, towels and socks. Adopt-A-Pet has requested items that include cat litter, canned dog and cat food, pet treats, pet beds, newspapers, blankets, pillows, sheets, towels, empty spray bottles, air fresheners, brooms, liquid dish detergent, bleach, antibacterial hand soap, masking tape, permanent markers, chew toys and cat toys. To learn more about the Giving Tree, contact the Student Government Association at sga@uhv.edu.